IT WAS nice to run into Andrew Smith from Launceston the other day when he rolled in to Mood Food for a quick cuppa on his way from Launceston to Hobart and then return. 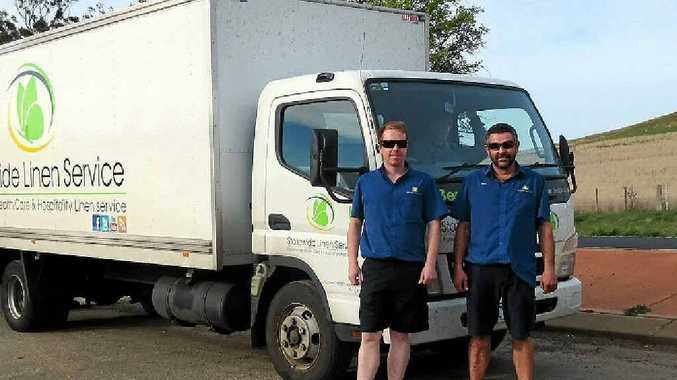 He was driving a Statewide Linen Service's 2010 Mitsubishi Fuso Canter HD 4.5 rigid pan, and told us they deliver linen to hotels and hospitality venues in Hobart daily. He told us he enjoys the job and says he has a good boss and a great crew to work with. That included Drew Curbishley, who was driving an identical truck on his way home to Launceston, and agreed to have his photo taken with Andrew at the time. Both blokes reckoned it was a top job. While at Mood Food, we heard that Emma was currently in Darwin representing Tasmania in the National Darts Championships, and we'd like to join all the crew at Mood Food, a certain Tolls driver and her many mates on the road in wishing her every success.